When was the last time that you actually talked good and positive about a religion which you don’t belong to? When was the last time that, in a discussion with friends, you were not really communal? When was the last time you believed in loving all religions at once more than loving only yours? Can’t remember, isn’t it? It’s not your fault actually. The world has become a bit selfish and we all need to fit in to survive. And the ones who do not follow the rules are the ones that make all the difference! This is what this young lad from Bengaluru does and makes us look at the positive side of life! Well no, he is not the late Saddam Hussain, the former Iraqi President, you are thinking about. Saddam Hussein is a 27-year-old boy from Bengaluru, and he is taking care of a Ram Mandir in Bangalore, for the past three years. He works as the caretaker of the temple and his everyday duties include cleaning up the premises and taking care of the temple as a whole. As per the reports, the chariot that goes out of the temple on a stroll for an annual rally during Ram Navami is taken care of by Saddam. He services the chariot, maintains the same and keeps it clean. Before this, Saddam worked at a shop and once his boss got engaged with the temple authorities as an office bearer, he started working at the temple too. In his own words, he is a Muslim by birth and has been working in the temple from the last 3 years. He feels good and it gives him peace of mind. He takes care of its complete cleaning. No one has ever objected or stopped him from doing it. He further believes that Hindus and Muslims are like brothers and he has his family’s support in doing this. Every year the temple witnesses a large number of devotees on the occasion of Ram Navami. This year the story will again be the same. 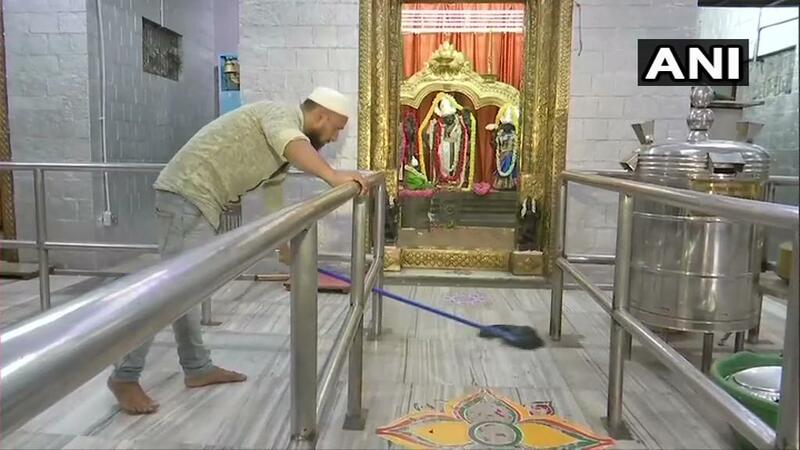 As the temple authorities are gearing up for 14th April 2019 (Ram Navami), Saddam is busy taking care of the temple and making it spick n span for the visitors! It’s about time that we start thinking on the lines of Saddam, don’t you think? We need to get out of all those religious shackles that society binds us in and need to embrace each other as humans. After all, it is our narrow-mindedness and not our religious values that teach us to create barriers in the names of our religions. Humanity will only rise up and above when we wish for the same and start doing our bit for it. Let’s just hope that we have more Saddam’s in each corner of our country and only then we can say that we have fully developed as a nation, as one! Next articleHow To Leave The Dull And Monotonous Summers Back In 2018?